I don't know about you, but I have a lot of chefs on my Christmas list (my husband included, and honestly most of his family), not to mention that I have become more and more of a home chef over the years. So this list is for the wannabe chefs and foodies on your list. Bon appétit. Top Row: 1. A chef can never have too many wooden utensils. I love the colored handles of this Now Designs Bamboo Utensils Set. // 2. What chef wouldn't love a Homemade Ravioli Kit? Uncommon Goods also sells a DIY Tamale Kit and Sushi Kit. Second Row: 3. 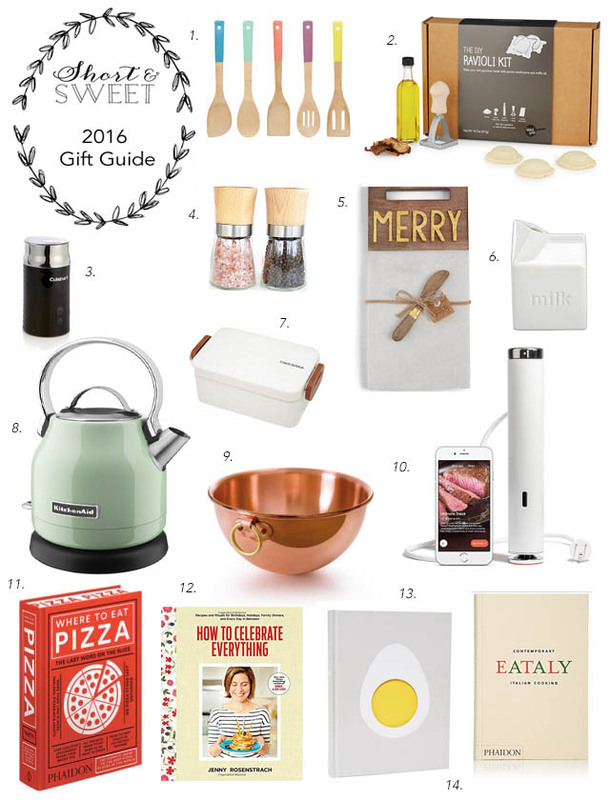 I'm hoping my husband is reading because this is on my list: Cuisinart Tazzaccino Milk Frother. It would make homemade lattes that much fancier. // 4. A pretty salt and pepper grinder is a necessity for any home chef. Willow & Everett Salt and Pepper Grinder Set. // 5. I'm of the opinion you can never really have too many serving items, especially for cheese. I love this one: Gold Merry Marble & Wood Board and Spreader Set. // 6. I can't even with this BIA Cordon Bleu Milk Container. // 7. Out with the old brown paper bag and in with a sleek white bento box: Takenaka Lunch Bento Box. Third Row: 8. An electric kettle that looks old school, and I love the color. KitchenAid Electric Kettle in Pistachio. // 9. You can't go wrong with a beautiful copper bowl like this one: Mauviel M Passion Copper Egg Beating Bowl is so beautiful. // 10. So most of the items on this list are approachable and for the everyday chef, but the Joule Sous Vide takes it up a few notches. Apparently it helps you cook everything, from steak to crème brûlée perfectly no matter what. Bottom Row: 11. Phaidon Where to Eat Pizza. Who wouldn't want this book? // 12. I adore Jenny Rosenstrach's blog, and her book How to Celebrate Everything: Recipes and Rituals for Birthdays, Holidays, Family Dinners, and Every Day In Between is on my own wish list (but would make a great gift as well). // 13. Another book that doesn't warrant a lengthy description but would be a good addition to any chef's cookbook collection: Egg. // 14. Created in collaboration with Italian food emporium Eataly, this cookbook features 300 of the best contemporary Italian home-style recipes. Eataly: Contemporary Italian Cooking.